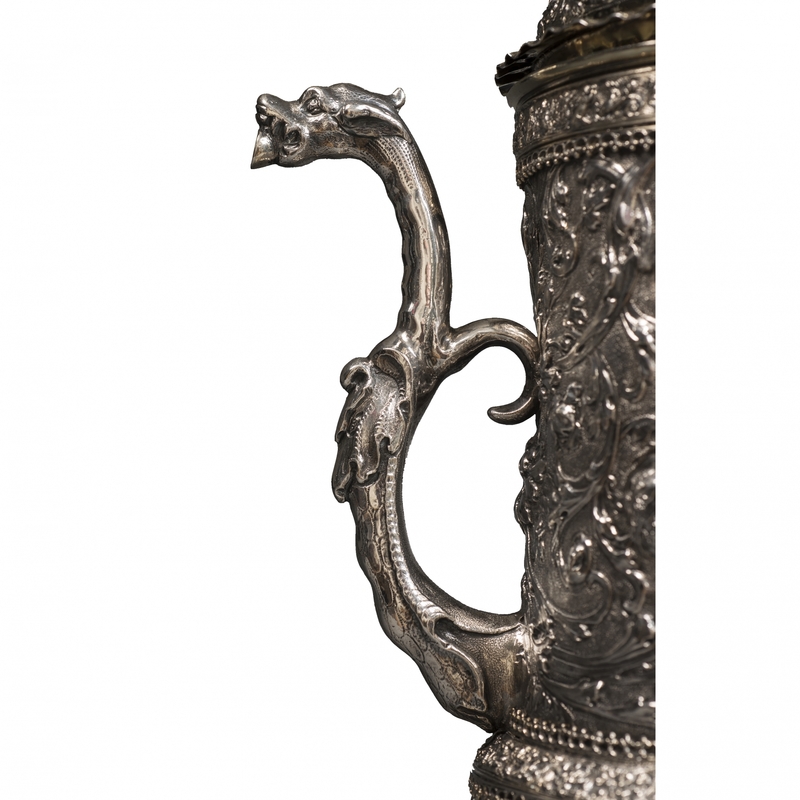 The silver wine jug is engraved with the coat-of-arms of the von Pendler family and is partially gilt. This tall jug with cover, spout and handle is very rare. It is richly decorated with an abundance of chased flowers, gilding and ornamented friezes- a true showpiece. Its shape is exceptional. At first sight, the jug does not seem to be Dutch as the shape is unusual for Amsterdam jugs from the third quarter of the 17th century. The shape, an elongated humpen with spout, is hitherto unknown. Only in the Kremlin in Moscow are two Amsterdam silver jugs with a similar shape, although these are not elongated. The silversmith Henricus Barents van Leeuwen was active in Amsterdam from 1663 onwards and was known for his chased jugs. He was born in 1639 as the son of Barent van Leeuwen and Lijntje Hendriks. His father Barents was a silversmith in Amsterdam as well. He died after 1689. His workshop was in the St Jansstraat and unfortunately most of his work is now lost. The two jugs in Moscow are made by Van Leeuwen's colleague Roelof Pieter van Emden van Vries. This silversmith, born in Emden and active in Amsterdam from 1655, made twelve beakers and two jugs for Grigory Stroganov in 1663. He also lived in the St. Jansstraat. 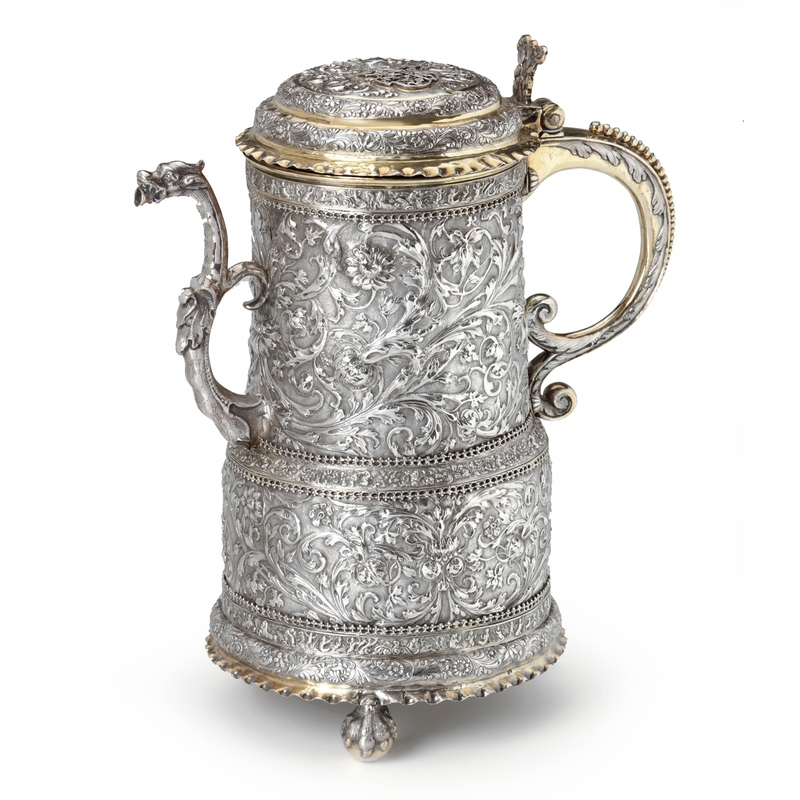 Two silversmiths from the same street in Amsterdam made similar jugs in the same year. What was the purpose of this jug? Since Stroganov's jug was accompanied by twelve beakers, we may conclude that the beakers and the jug were a set, possibly intended for wine. This means this jug is one of the first Dutch wine-jugs. Because the maker did not know how a wine-jug should look, he conconted a form from several shapes and parts that he knew. A giant beaker with cover applied with a spout. The spout was known from the oil- and vinegar sets such as the famous one by Anthonie Grill from 1642 that is now in the Rijksmuseum. The floral decoration on the jug is characteristic of the height of the floral style in the third quarter of the seventeenth century. This typically Dutch, exuberant type of floral decoration started around ca 1610 in tapestries and would develop into a national style of the seventeenth century, permeating all types of works of art. 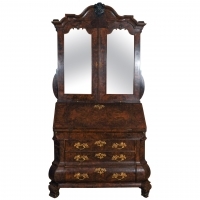 In the third quarter of the seventeenth century this style was most popular, especially in silver. The coat-of-arms on the cover is a seventeenth-century coat-of-arms of the Austrian family Pendler. It is not known when the Pendler family sold the jug. There are no auction records of a sale before 1900. Why this family commissioned or got this jug as a present is unknown. In the seventeenth century, Amsterdam was the world's most important city and its craftsmen had an outstanding reputation, especially when it came to silver. Possibly, someone wanted to show that he was a man of the world and ordered his silver in Amsterdam. Cosima de Medici visited Amsterdam in this period and commissioned paintings. 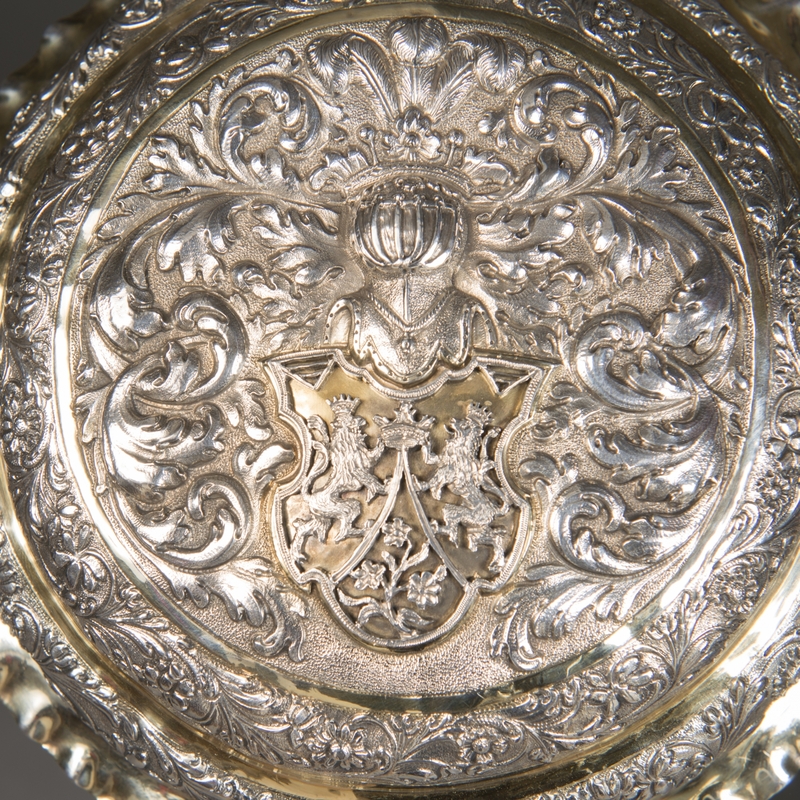 The Czech monarch Lobkowitz commissioned a complete Delft earthenware dinner service decorated with his coat-of-arms. The coat-of-arms of Pendler is published in the Siebmacher of 1705 and is listed in the Armorial General of Rietstap. in the Neue Siebmacher, that was published between 1854 and 1967, Pendler is no longer mentioned. Possibly the family was extinct by then or considered to be of less importance. From research in Austrian archives only Josefina Freiin von Pendler was found, who drew up a contract in 1798. Probably she belonged to the family of the jug's first owner. The jug is struck on various places with various marks. 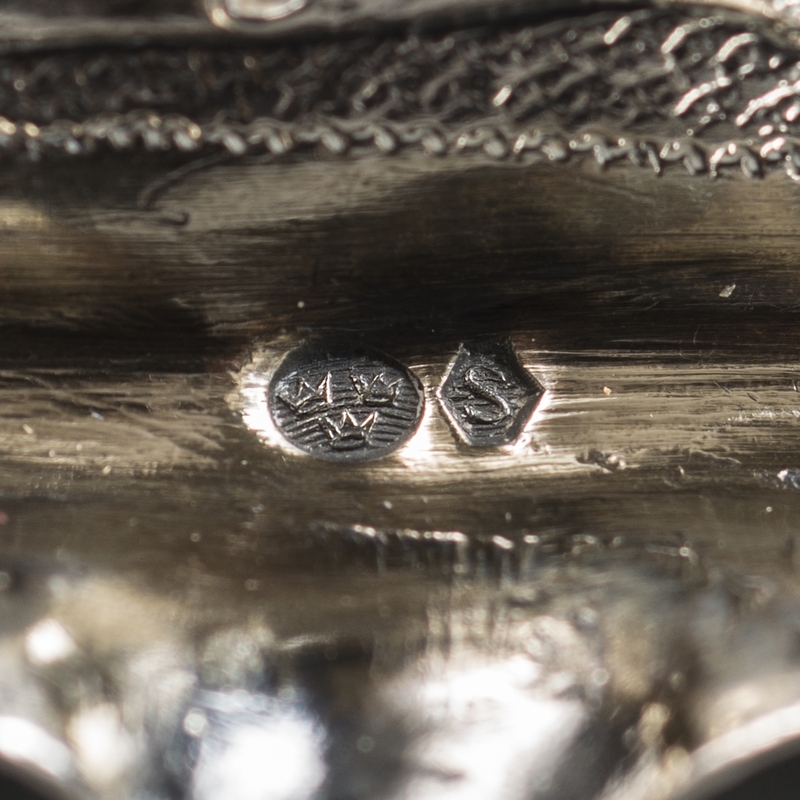 First of all the maker's mark of Van Leeuwen, the town mark of Amsterdam and the date letter L. This date letter is used in 1663 and 1673. Because of the fact that the jugs from Moscow ware made in 1663 (De Vries died in 1664), it is likely that the jug by Van Leeuwen was made in the same year. Several foreign import marks are struck. A French one from the nineteenth century and a Swedish one from after 1912. The jug is published for the first time when it was in the possession of Baroness James de Rothschild (1847-1931 Paris) in 1912. It was described as Hungarian. Laura von Rothschild was born in Frankfurt in 1847 and married her cousin James Nathan de Rothschild (1844-1881) from France. They lived in Paris with their son Henri. Possibly she brought the jug to France with her marriage (hence the French import mark used between 1864 and 1893). 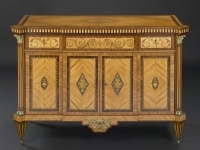 It may have been a gift or inheritance from her father Mayer Carl de Rothschild (died in 1886), the Frankfurt collector who bequethed an enormous collection to his five children. It may also be possible that the baroness had bought the jug herself to complement her own collection. After the death of Baroness James her son Henri (1872-1947) inherited the jug. He sold large parts of his inheritance and at a certain moment the jug emerged in Sweden (hence the Swedish import mark) with J. Ribbhagen. In the 1980's the jug came into the possession of antique dealer Beeling who exhibited the object and published it in the catalogue of the Delft art and antique fair and eventuallu sold it to J. Ritman.